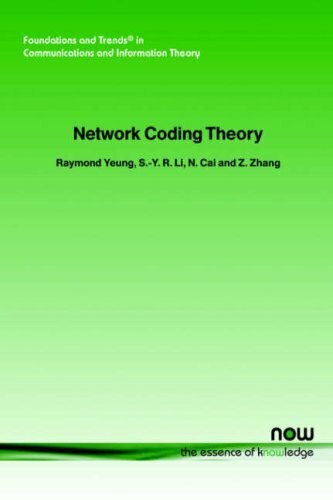 The present text aims to be a tutorial on the basics of the theory of network coding. The intent is a transparent presentation without necessarily presenting all results in their full generality. Part I is devoted to network coding for the transmission from a single source node to other nodes in the network. It starts with describing examples on network coding in the next section. Part II deals with the problem under the more general circumstances when there are multiple source nodes each intending to transmit to a different set of destination nodes. Shannon presents results previously found nowhere else, and today many professors refer to it as the best exposition on the subject of the mathematical limits on communication. It laid the modern foundations for what is now coined Information Theory. The conditional rate-distortion function has proved useful in source coding problems involving the possession of side information. This book represents an early work on conditional rate distortion functions and related theory. This chapter is supposed to give a short introduction to the fundamentals of information theory, especially suited for people having a less firm background in mathematics and probability theory. The focus will be on neuroscientific topics.